Constructed of stainless steel, brass, anodized aluminum, nylon, and other plastics. Manual override, metering, metered bypass, manifold mount, flange mount, 90° port left and right, orifice metering, and some other special options. Our large port Screw-in Series 20 valve body is for simplified manifold mounting and speed in processes involving liquid or gaseous media. Compatible with brass, stainless steel, or anodized aluminum manifolds. These brass bodies incorporate dual O-rings to eliminate leakage and provide the required high burst pressure ratings. The Series 30 Normally Closed Valves for LP and natural gas has low pressures up to 2 psi, larger flow passages and drilled ports for higher flows through the valves. 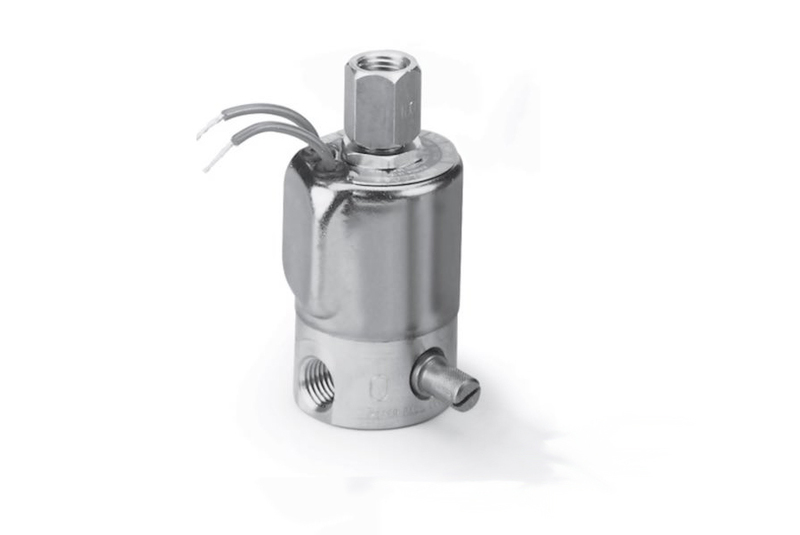 With a high flow of CV of .57, compact size, and economy, this solenoid valve can be used for commercial cookers or any kind of gas-fired heaters, decorative gas-fired lights, infrared heaters, small heaters, patio heaters, and more. Series 50, 3-way, Directional Control Valve with stainless steel components and FKM seals for oxygen service incorporate welded fittings with threaded ends. Valves are designed to meet requirements in analysis equipment and other applications requiring welded components. 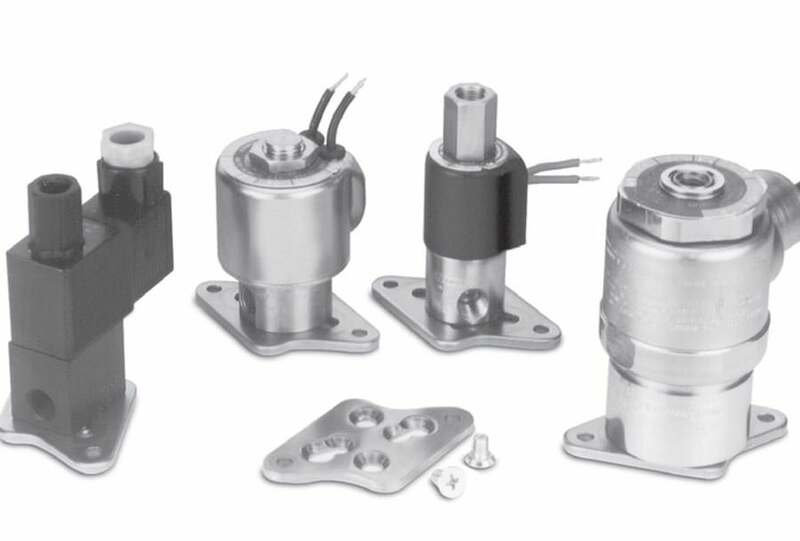 These solenoid valves are for use in vacuum chambers for sterilizing medical instruments. 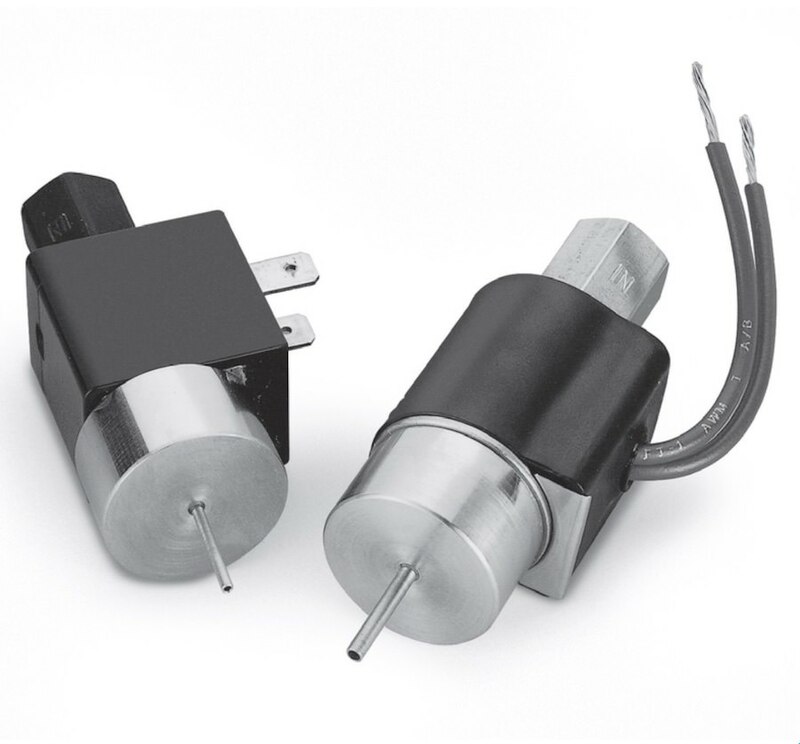 Two basic models have been developed: The smaller one is electrically operated with 1/2” orifice 2-way Normally Closed with FKM plunger seals and 12 VDC power. 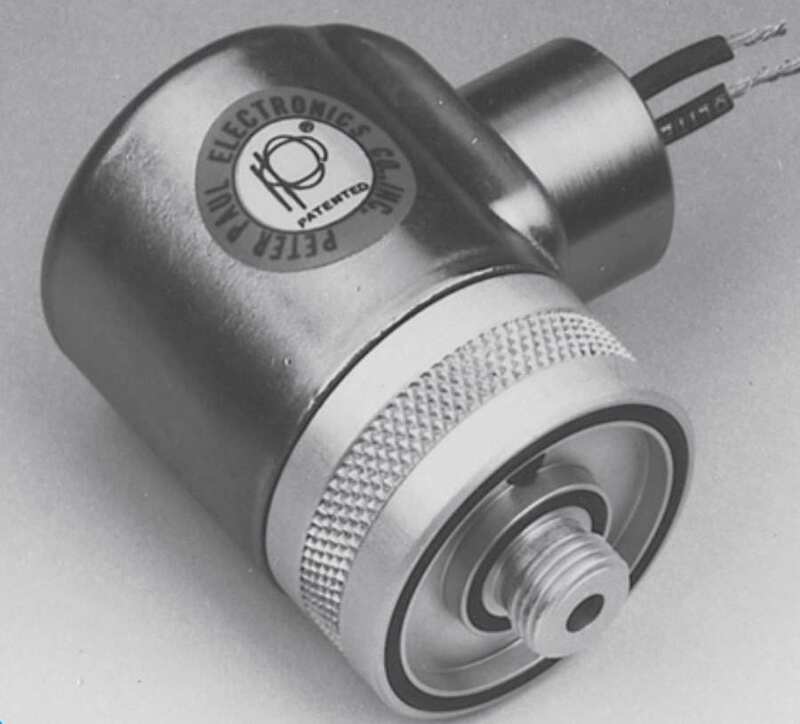 The larger valve is air-operated by a cylinder with 1” orifice with extended plunger stroke to meet high-flow requirements. Assembly of this unit involves electron beam welding of flange to body and a spring-loaded assembly seals on the orifice for fail safe operation. 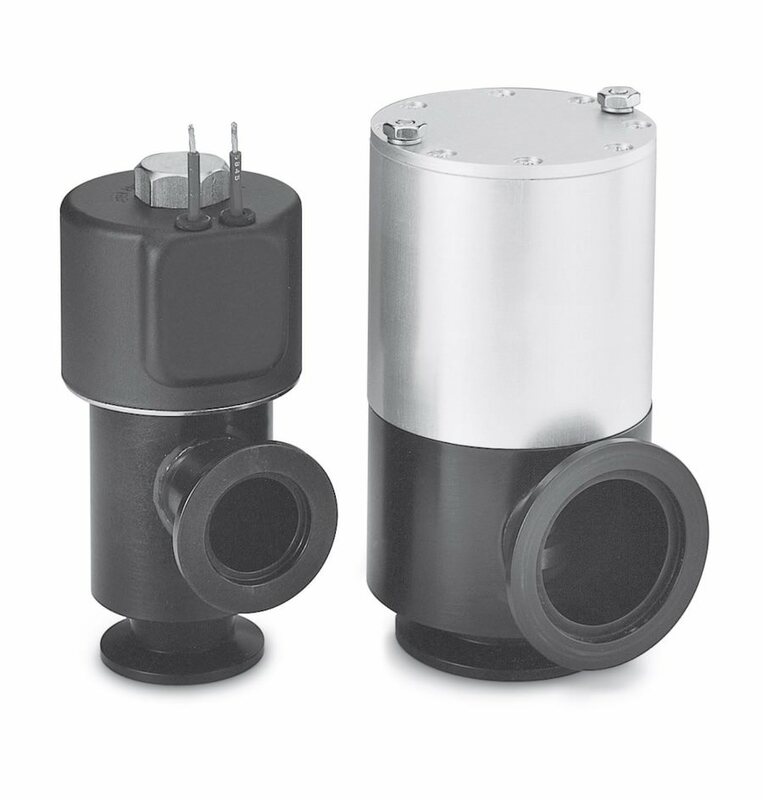 Both valves employ anodized aluminum bodies with stainless steel inner moving parts. 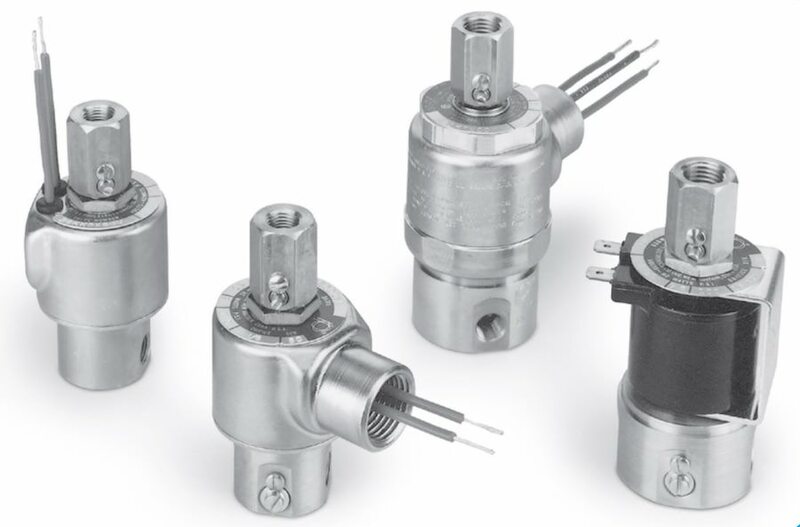 In addition to our line of molded 58 series solenoid valves, we have developed two stainless steel bodies that supplement the six models of plastic valves used in portable medical devices, analyzers, portable test equipment and similar applications. Two stainless steel bodies are offered in 2-way normally closed 10/32 stud mount (valve shown on left), and 3-way normally closed, piped exhaust, 10/32 female ports (valve shown on right). We’ve announced a new, completely sealed, Series 50 solenoid valve to meet today’s stringent requirements for chip manufacturing, analysis equipment, and other types of ultra high purity equipment requiring welded components. 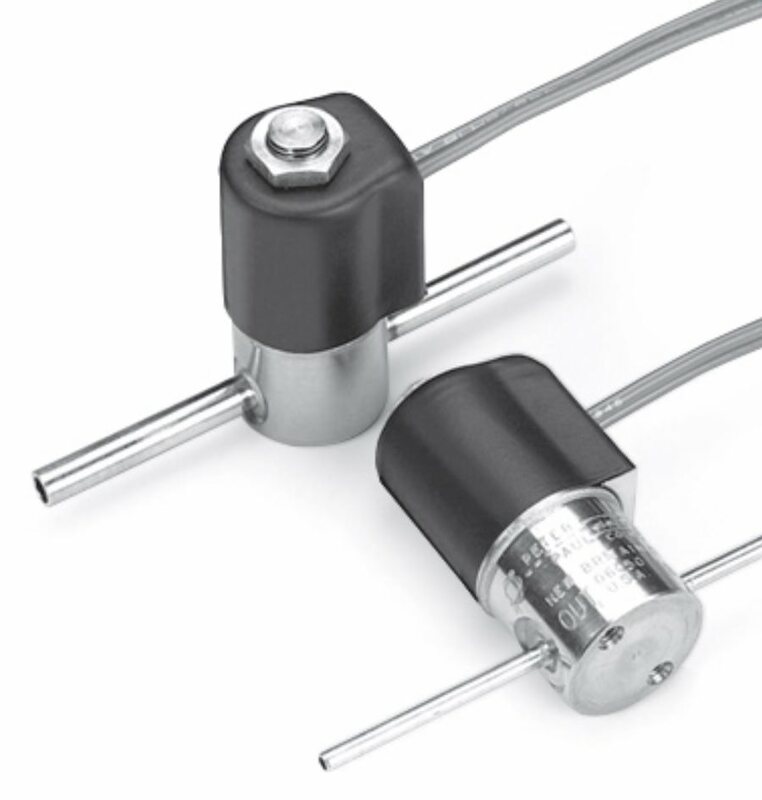 Available immediately in a 2-way, Normally Closed configuration, the valve can be produced in many AC or DC voltages. 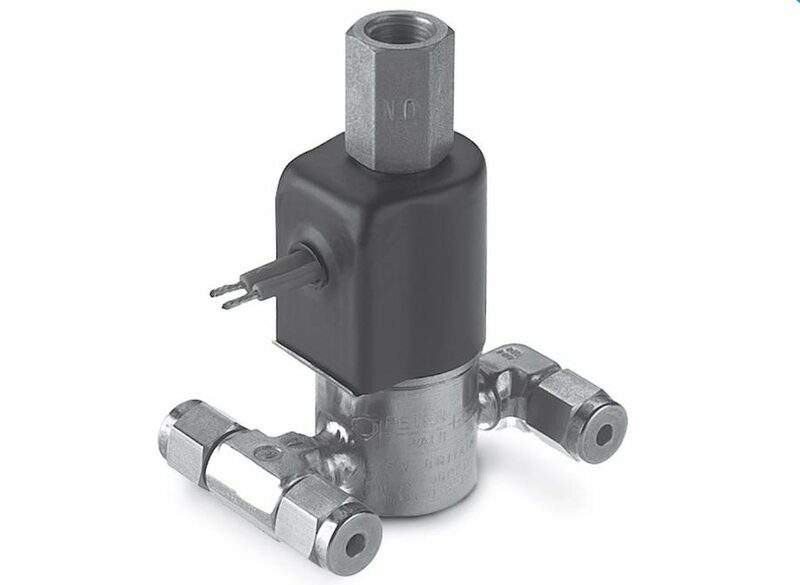 These Series 50 valves feature all 430F stainless steel construction with either 1/8” or 1/4” O.D. stainless steel welded tubing as their port connections. The sleeve assemblies of these valves can be attached with conventional threads and elastomeric seals or, for the most critical applications, with the body welded directly to the sleeve assembly. Both grommet and conduit-style housings are offered, with internal electro polish available. Employing all our standard components for millions of trouble-free operating cycles, these fully sealed Series 50 solenoid valves are available with all standard options including 3-way operation, quiet operating diode rectified coils, and more for continuous operation at maximum rated pressures as required. 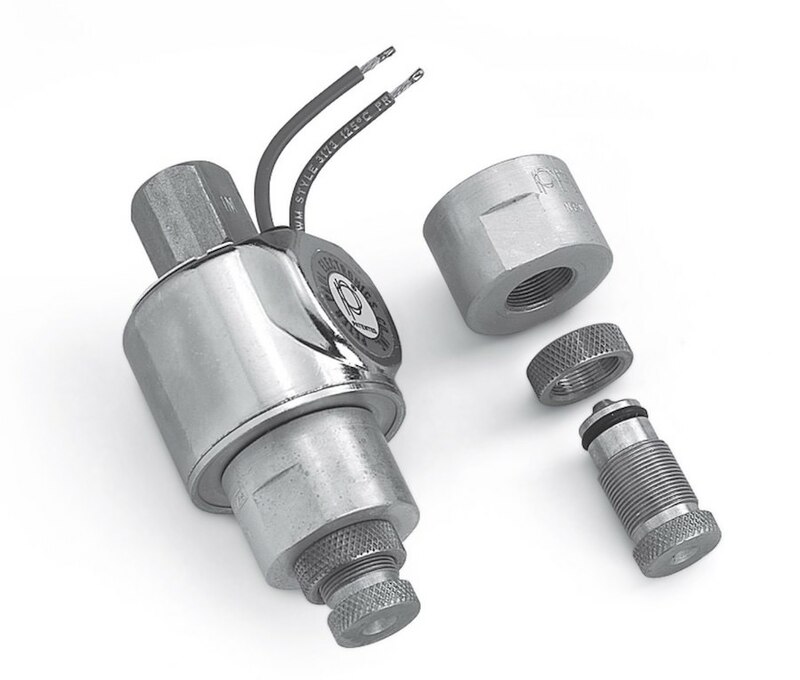 This adjustable, stainless steel metered adapter, for use on either the top inlet or exhaust, allows the user to set the best possible flow parameters for the specific application. With these adapters, it’s possible to pipe the exhaust from the solenoid valve out of the area rather than exhausting directly to atmosphere. The adapters are available for 1/8” NPT or 1/4” NPT porting and are used for liquid and gaseous media and is typically used as a metered exhaust for 3-way normally open valves, or as a metered normally open port in a multi-purpose or directional control valves. The manual override option is built into the bodies of these valves and won’t affect their normal operation except in the case of power failure or similar circumstance. 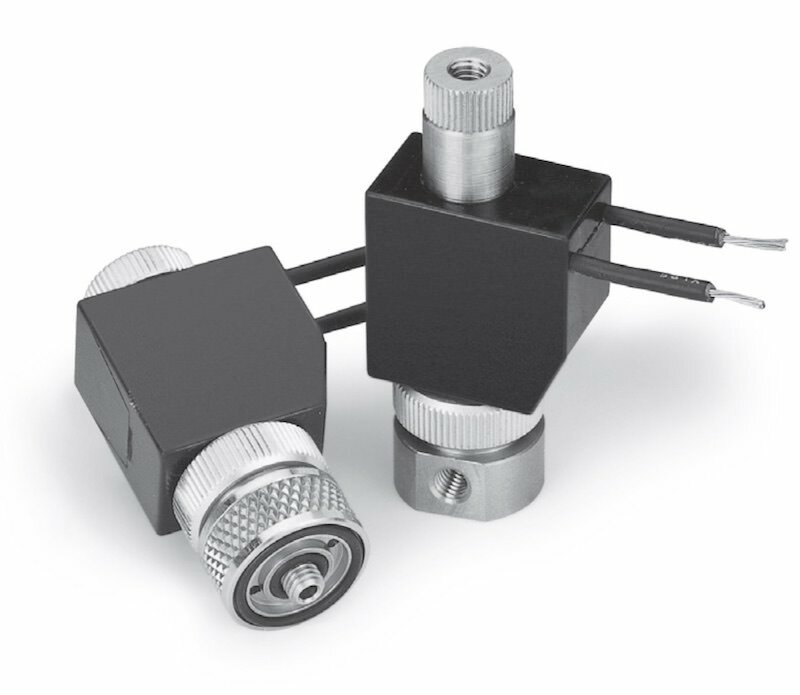 The manual override option adds marginally to the cost of the valve and is available as a factory option on many models of our Series 58, and 20 solenoid valves. 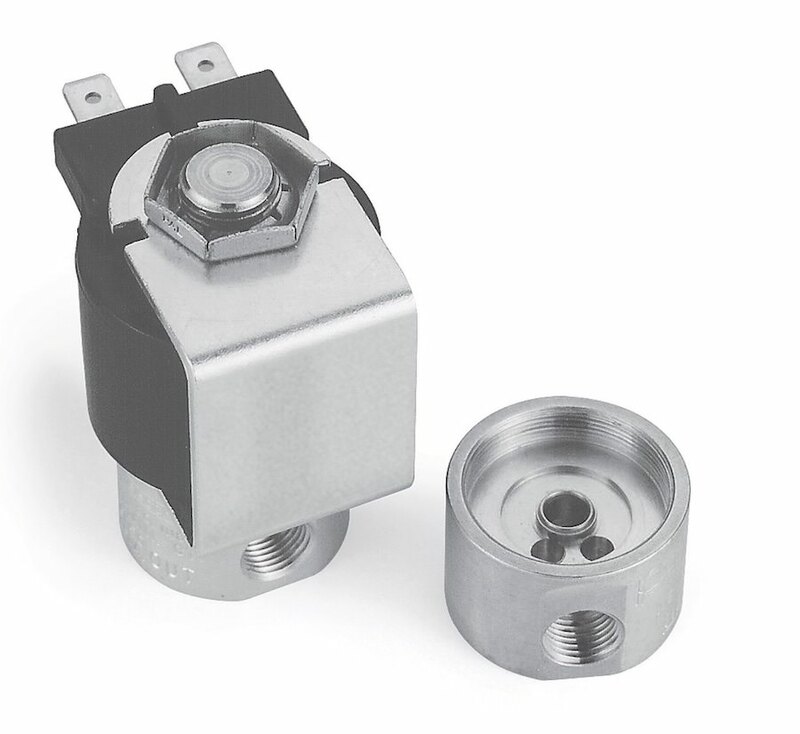 Our squirt valve is an in-line two-way Normally Closed Series 15 or 50 solenoid valve with double plunger seal that does not allow continuous flow, but will shut off, energized or de-energized. This squirt solenoid valve comes with a variety of tubes sizes which control drop sizes. Low pressure rating of two psi to ten psi is available. Anything less than two pounds pressure doesn’t provide enough velocity for a good drop or squirt. The small dispenser tube is critical only in its diameter and controls drop size and squirt length and the bigger the drop the shorter the carry. These stainless steel versions are available in either AC or DC. We have a universal mounting bracket for when the mounting surface is very thick or physically inaccessible. It is part number B96, for individual, solenoid valves in Series 15, 20, 30, 50, and 70. The zinc plated, carbon steel bracket is provided with screws and several countersunk hole configurations, the brackets are easily installed and may FPO be used in virtually any operating environment.